I promise to stop blogging about food very soon. Anywho…. Today I had bibimbap for dinner. The red pepper sauce is just a mixture of 3 parts red-pepper paste and 1 part sesame oil. The fried veggies I chose were spinach, zucchini, and carrots fried in olive oil and garlic. 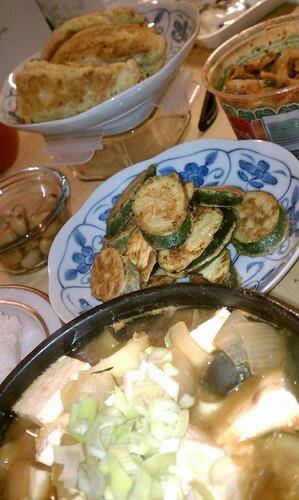 I also added some kimchi on the side. Additionally if you’re a health-nut, this is a recipe where using brown rice will not detract (unlike sushi, where it does detract in my opinion). NOTE FOR DIABETICS: I only use about 1/2 cup of rice. This is not much, and if you order this in a restaurant they give about four times this. If I ordered this at a restaurant I should probably dump some of the rice on a separate plate and put it far away since I have a tendency to eat whatever is on my plate once I begin. Two days ago my wife made the best meal! i have made way better meals than that!!! but thank you anyway! i will make real authentic soondubu and take a picture for you to post, since your soondubu looks anemic.